LARGE Barn Light Green Shade. 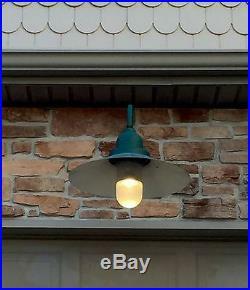 Gas Station Style Lamp. 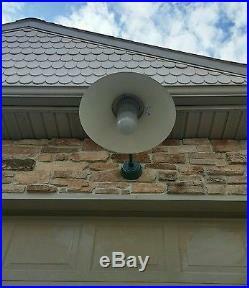 CUSTOM Metal Canopy Lamp - SPECTRUM LIGHTING. 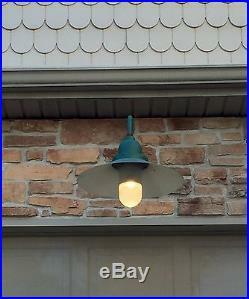 Green gas station style goose neck arm canopy light, barn lamp. Made and manufactured by SPECTRUM Lighting in Fall River, MA. A classic reproduction in their RLM Series. Minor surface scratches consistent w age. 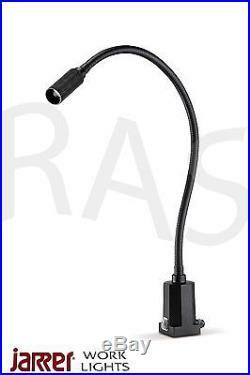 Light needs to be rewired for LED or fluorescent socket. 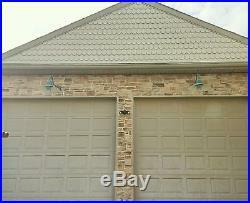 See item specifics, measurements and photographs. 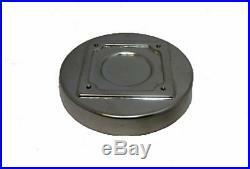 20.5 D aluminum shade. 8 frosted glass bulb enclosure. 25.5"L to center of shade and 35.25"L total as shown. 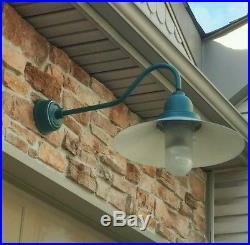 Cast aluminum wall ballast 4" H x 6.25" W. 3/4 aluminum goose neck pipe 22.5"L x 6"H. Frosted glass lamp enclosure 8.25" H x 4" D. Powder coated paint - matte green finish. Exposed surfaces treated to resist corrosion. Built to UL standard #1598. Weighs 11.5 lbs. 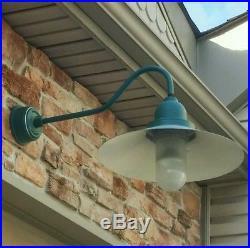 The item "Large Classic Barn Lamp Gas Station Light Green Shade Goose Neck Arm Custom" is in sale since Sunday, February 21, 2016. 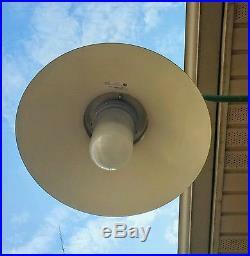 This item is in the category "Collectibles\Lamps, Lighting\Other Collectible Lighting". 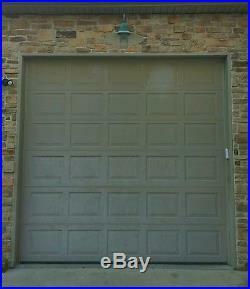 The seller is "kesla67" and is located in Mount Holly, New Jersey. This item can be shipped to United States, to Canada, to United Kingdom, DK, RO, SK, BG, CZ, FI, HU, LV, LT, MT, EE, to Australia, GR, PT, CY, SI, to Japan, to China, SE, KR, ID, to Taiwan, TH, to Belgium, to France, to Hong Kong, to Ireland, to Netherlands, PL, to Spain, to Italy, to Germany, to Austria, RU, IL, to Mexico, to New Zealand, PH, SG, to Switzerland, NO, SA, UA, AE, QA, KW, BH, HR, MY, CL, CO, CR, DO, PA, TT, GT, HN, JM.